I am a huge fan of the Assassin’s Creed game series, but upon hearing about all the glitches and incompleteness of the game itself, I decided to wait a while before I purchased it, just to give Ubisoft time to fix it all. So when I did eventually hold my very own copy of the game in my hands, I was delighted to find that all the problems I kept on hearing about were all patched up. Unfortunately, my delight did not last very long. Let’s get on with it, shall we. As I said before, I love the Assassin’s Creed series, from playing as Altair to Ezio and even Desmond. Then I played Assassin’s Creed III… which was disappointing. And Assassin’s Creed IV: Black Flag was a better successor, but ultimately, I had a feeling of dread. Other than that base concept, there was very little in the game’s story that I did enjoy. Arno’s character was the rogue-ish type, sure, but he wasn’t the loveable rogue to me, and his circumstances, attitude and romances didn’t work well in the game. He was an arrogant aristocrat, and while I can understand some of his righteous attitude, I did not like him at all. On the romantic side, I think Elise was a weird choice of partner. I mean, after the death of his father, Arno was adopted into Elise’s family by her father. So they do become brother and sister, but they never see themselves like that. And hell, there is basically no present at all. The whole modern era of the game is your player in first person view stuck in an animus machine which the Assassin’s have hijacked and recruited you into their organization. It’s all very short and quick and I feel they have started to regret killing off Desmond Miles. Shaun makes a return – kind of – and we see a new member of the Assassin Order, a woman code-named Bishop. These 2 people are the only real connection we have to the modern day era. Throughout certain points in the game, and specific missions, they make an appearance, but their importance was lost on me and I felt like they could’ve been given a bit more depth. They use the initiates story well enough, and use it to promote their multiplayer system where you can join with friends or strangers to play in the Paris sandbox together and do co-op missions. I have to say I really did enjoy the new customization feature added to AC:U, it didn’t change only how you looked cosmetically in the game, but for example how stealth-like you could be, or how much health you had, or it allowed you to carry more lockpicks, or smoke bombs. The point is, you could almost tailor a look and attributes to your play style. It gave you more flexibility on how you can decide what type of weapon you wanted to use, whether it was a one handed sword, or a two handed trident, or a heavy club, was a big plus too. (My favourite weapon to use is the Katana). What bugged me a bit though was how some of the customization items had to be unlocked by doing some online co-op missions, and for a more solo player like myself, it annoyed me more than it should have. 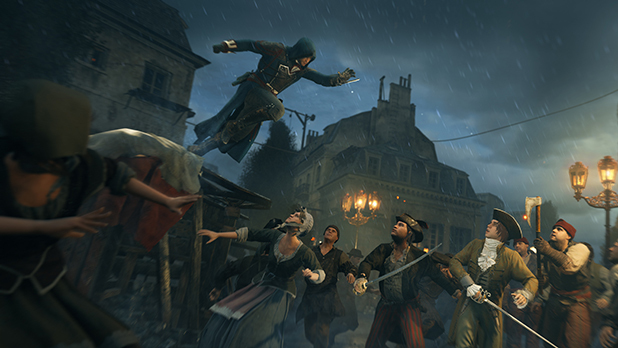 When I heard that AC:U was going to be set in Paris during the French Revolution, I did wonder how the free running was going to evolve. Throughout the Assassin’s Creed series there have been great strides in how the player traverses around the world, I saw this especially in AC III where we could climb the trees and wilderness. So when I thought of Paris; dense, messy, and full of people, I wanted to see what they came up with. During the game demo, the first few seconds demonstrated a free running that specialized on a downward trajectory and it was awesome! We could now free run downwards without having to slow down or look for complicated routes down without just flying off the roof and hoping you didn’t de-synchronize when you landed. I was less excited to see how they remade their combat system. Honestly, I did like the low-profile and high-profile system from the first few Assassin’s Creed games, but I think many people had trouble with them, so while progressing through the games I started to see those one button attack and one button counter system. AC:U didn’t improve much upon them, the only change I saw was that they rewarded the player for ‘perfect parry’s’ when they countered the enemy at the right time, the thing is it wasn’t that hard to do so seeing as there was a glowing gold bar above their heads when you had to perfect parry. I also felt the controls were kind of sluggish. The dedicated stealth system, yeah, we can actually crouch down now. 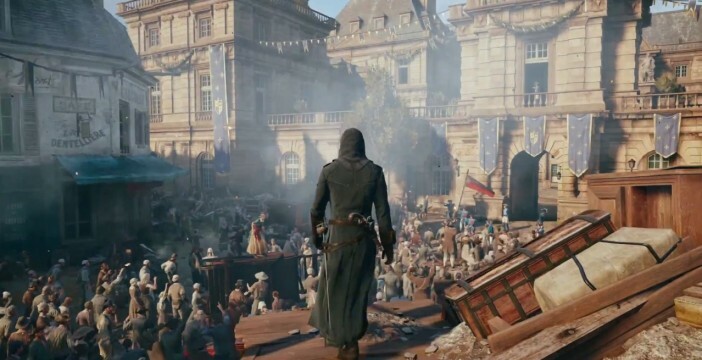 For a stealth game, I was kind of surprised how long it took them to implement a crouch-down style stealth system, but then again, Assassin’s Creed has always been about blending into people, being that blade in a crowd. But it was fun to use this system, obviously there were some bugs and it didn’t work as smoothly as I had expected, but I did like the option to perform lethal or non-lethal takedown’s from corners or behind furniture. The last thing I will mention is Paris. It is massive, and it is grimy, dirty, and full of people. I think they captured it pretty well while the revolution was happening. It was fun to traverse Paris and all it’s landmarks and discover and solve the puzzles and riddles of the city. While it was impressive to have so many NPC’s in one place, they did kind of get annoying to go through, they were just in my way most of the time, but hey, it seems accurate. IT has been a few months since it’s original release back in 2014, and due to all the bugs and glitches, many said that AC:U was a broken game and that it was unplayable. 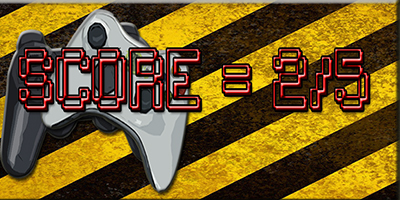 Well, I have to say that even though there are some good qualities about this game – however little they may be – it is heavily outweighed by all the bad qualities. Not good Ubisoft.